Israel is the one country that is mentioned in the media, and often excoriated, to an extent way out of proportion to its tiny size. With each terrorist attack, with each war, and yes, even with each lively internal controversy in the Jewish state, the world hears confusing reports from the remarkable miracle called Israel. But are they getting the full and accurate picture? Is Israel the “bad boy” of the Middle East or is it a “light unto the nations”? Then again, could it be something else altogether? 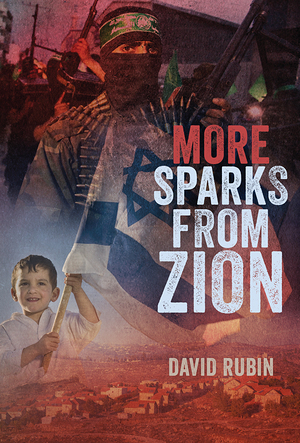 In More Sparks From Zion, David Rubin picks up where he left off in his previous book by a similar name, explaining in his trademark clarity the burning issues in Israeli politics, as well as the often troubling relationship between Israel and its American ally. Rubin addresses the increasing Islamic threat to the free world, what he calls the Islamic Tsunami, as exemplified by ISIS and a soon-to-be nuclear Iran, both of which are determined to export their Islamic revolution throughout the world. Rubin even delves with no hesitations into the raucous 2016 American presidential race, providing some fascinating insights into the Israeli perspective on an election that may determine America’s ability and willingness to stand with Israel in confronting the challenges. More Sparks From Zion is a must-read to understand what is really happening on the front lines in Israel and the Middle East, as well as its ramifications for a free world under threat like never before.